Waterlily dahlias have a very delicate appearance. Flower heads on this type are almost always double. The petals centre around a very tightly closed dome shaped middle with four to seven rings of fairly well spaced petals emerging from it. The overall shape of the flower is almost flat. From the side, the waterlily dahlia takes on a saucer shaped form. Petals are mainly flat or they will have a slight inward curve. Overall, the flower depth should be less than half the diameter of the bloom. Waterlily dahlias can be grown to a broad range of sizes from miniature (less than 10cm or 4 inches) to giant (more than 25cm or 10 inches). Anna Lindh - this is a classic, pure white colour. This dahlia grows to a height of 110 cm or 3’ 7’’ and produces medium sized flowers which range from 15-20 cm or 6 – 8 inches wide. It can be grown from a cutting or a tuber. Carolina Moon – this produces flowers that are white with lilac edging for an unusual overall effect. They grow to about 100 cm or around 2 ft high and produce smaller flower heads that are 10 – 15 cm or 4-6 inches wide. Taratahi Ruby – this is a very dramatic red colour. 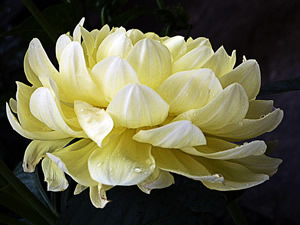 This dahlia grows to a height of 120 cm or about 2 ft. The flowers are around 10 – 15 cm or 4 – 6 inches wide. This is classified as a small dahlia.